For most people, if you want to buy your own home, you need to take out a mortgage. Or if you buy a new car, a car loan is necessary to make it happen. Most Christians, that I know, think nothing of this practice today. Several Christian friends of mine are even loan officers at different mortgage firms. But prior to the Reformation in the 16th century, it would have been unthinkable for a Christian to loan money out to other people at interest. The Western medieval church banned the practice of Christians loaning out money to others, and charging interest, through a series of church councils, such as the Second and Third Lateran Council (1139 and 1179) and the Council of Vienna (1314). If you were ever convicted of making loans and charging interest, you could be even denied a Christian burial. Forbidding usury has its roots in the Old Testament, something that Muhammed picked up as well in Islam, which is why Sharia law also forbids loaning money to other people, and charging interest. Calvin’s ideas were not immediately accepted, as some believed that Calvin was shying away from the “clear” teaching of the Bible. But Calvin was not ultimately labeled as a being some kind of “liberal,” a charge often brought up against someone today, who might suggest that a traditional Bible interpretation be rethought. Nearly 500 years later, Calvin’s views about usury are standard among nearly all Christians. You can be a home mortgage loan officer, or work at a bank that does car loans, but you can not be a “loan-shark,” who charges exorbitant interest rates to exploit the desperate and needy. Changes like these, in how Reformers, like John Calvin, read the Bible, is what impressed the late 19th century German sociologist, Max Weber, to write his classic, The Protestant Ethic and the Spirit of Capitalism. Many of us grew up hearing about Weber’s “Protestant work ethic,” and its association with capitalism. Today, economists and historians dismiss many elements of Weber’s thesis. But it is difficult to imagine how the modern banking system, with home mortgages, car loans, and credit cards, would ever have emerged, if John Calvin had not re-examined the meaning of “usury” in the Bible. So, the next time you make your mortgage payment, and you are grateful that it allows you to live in your own home, just remember to thank the Reformer, John Calvin. This blog post inspired by reading Alister McGrath’s Reformation Thought. Why are Protestant Bibles shorter than Roman Catholic Bibles? Bible scholar Bill Mounce explains why in less than six minutes. I have to note one small correction to Dr. Mounce in the video, in that while much of the Apocrypha was written in Greek, not all of it was. Some books of the Apocrypha were written in Hebrew, some in Aramaic, and some we do not know for sure. But those Apocryphal works in the Septuagint were all translated into Greek. Either way, after the fall of Jerusalem in 70 A.D., most Jews rejected the Apocryphal books of the Old Testament as being on par with the rest of Scripture. 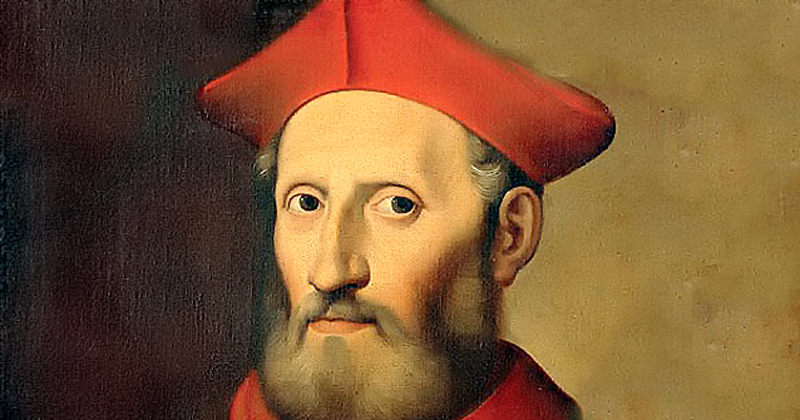 Gasparo Contarini (1483-1542). Italian Reformer within the Roman Catholic Church. Contarini oversaw the Catholic delegation at the Diet of Regensburg. Aside from his influence in the Reformation, he is often remembered as one of the chief proponents of Ignatius of Loyola’s Jesuit order. Sixteenth-century Europe was deeply divided by the fires of the Protestant Reformation, ignited by the German seminary professor, Martin Luther. In less than 25 years, the Christian West was torn asunder, Catholics versus Protestants, and even Protestants versus Protestants. The different sides were often talking past one another, and sometimes severe violence erupted. The emperor of the then Holy Roman Empire, Charles V, was desperate to find unity in his beleaguered Europe. The Islamic Turks threatened from the East, and in 1541, Charles turned to both Catholic and Protestant leaders, for a last ditch attempt to pull everyone together, to resist the outside menace. The city of Regensburg, known to the French as “Ratisbon,” was chosen for the meeting. It would be a dialogue between the various parties, what was then known as a “colloquy” or “diet.” Charles had selected some of the brightest leaders to represent both sides. Sadly, the names of these men are often forgotten to history. As is often the case, more flamboyant or extreme figures are etched in people’s memory, like Martin Luther, King Henry VIII, and Pope Leo X. But here I want to focus on two such, less well-known individuals, and how they sought to heal the theological and spiritual rift in Europe. 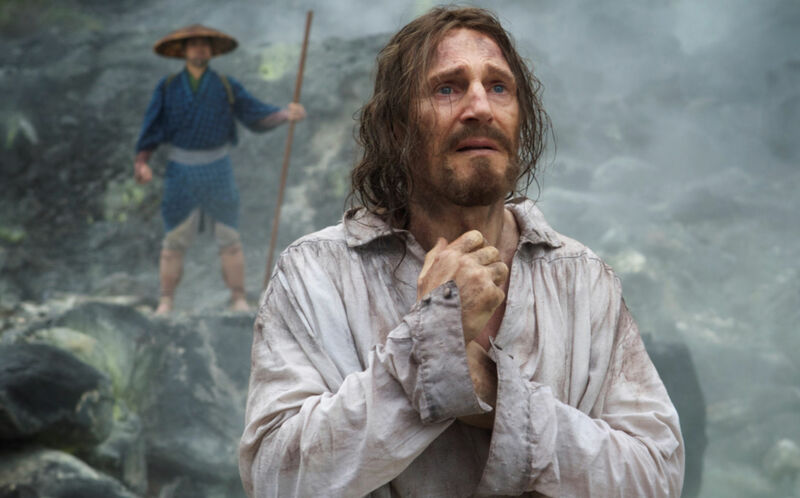 Martin Scorsese’s 2016 film, Silence, tells the story of Jesuit priests caught in the thick of Japanese shogun persecution of Catholic Christians, in the early 17th century. This critically acclaimed film is based on a book, of the same name, by Shūsaku Endō. While 16th century Reformation Europe was embattled with conflict between Roman Catholics and Protestants (and at times, between Protestants and other Protestants), the growth of Christianity exploded across the “New World,” with missionary enterprises extending from the Americas, to the far corners of Asia. With only a few exceptions, Protestants were generally too preoccupied by their conflicts with Rome, and their own internal conflicts, to be fully engaged in this world missions effort, at that present time. Instead, the Roman Catholic church, following the discoveries of new trade routes and new lands, sent missionaries out in great numbers, to bring the message of Christianity to the world. One of the main engines behind this missionary zeal was due to the founding of the Society of Jesus, otherwise known as the Jesuits, in the 16th century. In 1521, the same year as Luther’s famous appearance before the emperor Charles V, at the Diet of Worms, a Spanish soldier was severely wounded in the legs, thus ending his military career. Ignatius of Loyola spent months in recovery, where he had access to a theological library, to bide his time, while he was on the mend. It was here where he underwent a spiritual conversion, and developed the Spiritual Exercises, a manual for Christian growth. Ignatius went onto study theology in France, which was just then enveloped in turmoil, due to the Reformation, causing another student, John Calvin, a few years later, to flea the country, to Geneva, Switzerland. But Ignatius was suspicious of the Reformation, with its emphasis on private Bible interpretation, and held to Roman Catholic ideals. Nevertheless, Ignatius was bothered that so few priests and members of existing monastic orders had very little in the way of theological education. 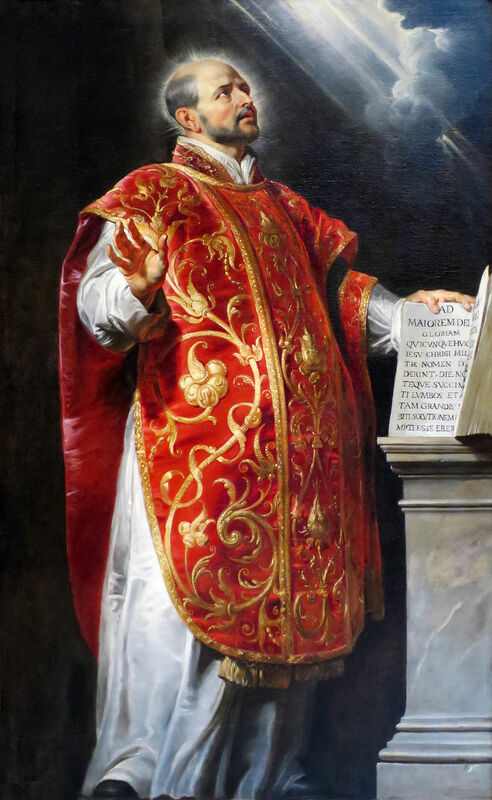 Along with a group of friends, Ignatius found favor with the Pope to form the Society of Jesus, in 1540, as a new monastic order, that aimed at combining advanced theological education, with Christian mission. The Jesuits have been known to be very loyal in their service of the papacy. In some cases, their loyalty has proved to be overzealous. The 16th century Roman Catholic Queen of England, Mary, has been known as “Bloody Mary” among Protestants, to this day, due to her execution of some 300-400 Protestant leaders, in her efforts to force England back into Roman Catholicism. However, in later years, Protestant Queen Elizabeth I, of England, exceeded the brutality of her half-sister, Mary. What is often not known, is that Elizabeth had perhaps 1,000 Roman Catholics executed, during her reign. Many of those executed were members of the Jesuit order, as some of those Jesuits had been involved in assassination attempts against Elizabeth’s life, thus encouraging the Queen to crack down on the presence of Jesuits in England. However, the Society of Jesus, in the 16th century, was mainly known for their extensive missionary efforts across the world. Frances Xavier, one of Ignatius’s friends, baptized thousands, all across Asia, in the name of the Christian faith. The missionary strategy of the Jesuits was quite remarkable: If you focus your energies on reaching the leaders of a nation, or ethnic group, and they become Catholic, then the rest of their people, under the leader’s authority, will follow in their footsteps. This is why Roman Catholicism continues to be the dominant Christian faith across the world, from Latin America to the Philippines. The strategy proved effective across much of Asia. But it backfired tragically in Japan. Jesuit missionaries made efforts to reach leading families of shogun elite in Japan, as early Portuguese traders made their way into the western Pacific. Thousands received Christian baptism. But when in-fighting began among these shogun families, the missionary efforts of the Jesuits came under suspicion. The situation was not helped by the growing presence of newer Franciscan missions, that took a different strategy, focusing their efforts on reaching the poor, and thus encouraging those poor to rise up above their oppressive situations. On top of that, Dutch and English Protestants warned the Japanese leaders about reported subversive tendencies of the Jesuits. Little did the Dutch and English know that the Japanese understood nothing of the distinctions between Protestant and Roman Catholic, and soon, all of Christianity in Japan was under attack. By the early 17th century, and within a fairly short period of time, all Christian missionaries were banned, thus ending the Western Christian missionary enterprise in Japan. The new Japanese leadership embarked on the most severe and brutal campaign of Christian persecution, nearly wiping out all of the new professing Christians, with literally thousands and thousands of crucifixions, mocking the central feature of Christian faith: Jesus’ death on the cross. Nevertheless, church planting efforts in Japan today are starting to show fruit, through God’s providence. But the work is often slow, and the workers are few. The vibrant era of Jesuit missionary work in the 16th century, across the world, highlights the significance of what historians now call the “Catholic Reformation.” Previous historians, mainly Protestant, have called this the “Catholic Counter-Reformation” instead, thus indicating that the growth of movements like the Society of Jesus were a response to Protestantism. There is some truth to this. But this designation takes away from the fact that there were efforts, with varying levels of degrees, and varying levels of success, that tried to reform the medieval Roman Catholic Church from within. 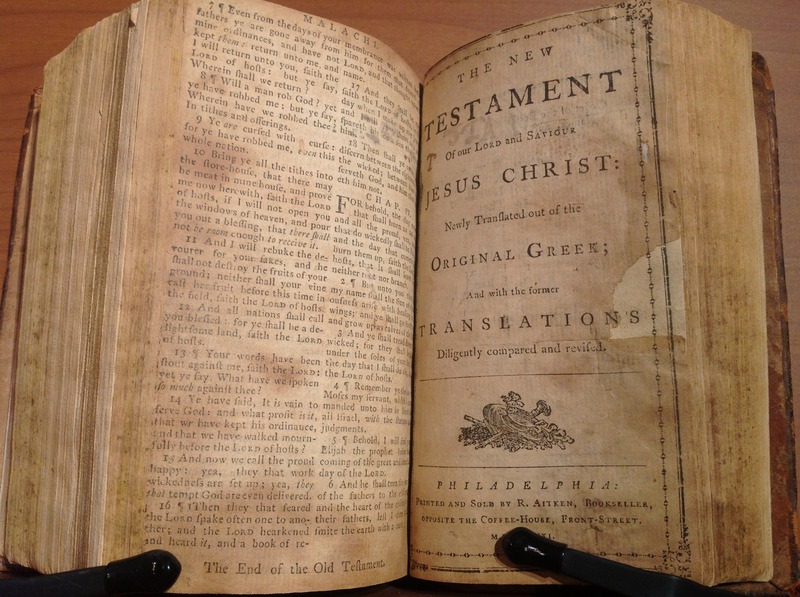 Did the Continental Congress Publish America’s First Bible? The Aitken Bible, the “Bible of the American Revolution,” remains a source of confusion, for many Christians today. A rare copy of this Bible is on display at the new Museum of the Bible. The Museum of the Bible, which opened in Washington, D.C. in November, 2017, seeks to educate visitors about the role of the Bible in America. We need such a museum, as an examination of the evidence reveals a number of misconceptions people, even some Christians, have had about America and the Bible. Prior to the American Revolution, most of the colonies embraced some form of public commitment to Christianity. For example, in those days, the Church of England was the official faith of my native state Virginia (then a colony), supported by law and the collection of taxes. If you considered yourself an “Episcopalian” or an “Anglican,” you were in good company. But if you were a Baptist, you might have problems. For example, weddings performed by Baptist clergy were not legally recognized in the colony of Virginia. So, if you were Baptist, and you could not abide by the wedding liturgy of the Church of England, you were in trouble. For according to the law, you and your Baptist spouse would be “living in sin,” unless an Anglican priest married you. Therefore, a common secularist canard, that Christianity was never really part of the founding of America, can be easily dismissed. True, Christianity, broadly speaking, was not, in a strict sense, the “official” religion of America, in the early decades of the young republic. The Founding Fathers, and American leaders after them, were certainly not opposed to the spread of Christianity, but they were increasingly inclined not to make explicit, governmental endorsements of the faith. 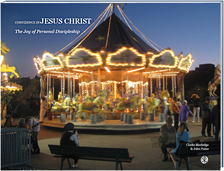 However, for all practical purposes, Christianity was the de facto standard of faith, towards the latter end of the 18th century, and even into much of the 19th and early 20th centuries. Nevertheless, a commonly accepted belief today comes under scrutiny here: What about the Continental Congress? Did not the Continental Congress actually print the first American Bible in English? Was not this first Bible distributed for use in public schools? Was this not an explicit, government endorsement of Christianity?